Venezuela's Health Care System Ready To Collapse Amid Economic Crisis The Pharmaceutical Federation of Venezuela estimates the country is suffering from an 85 percent shortage of medicine amid an economic crisis also marked by severe hyperinflation and food scarcity. 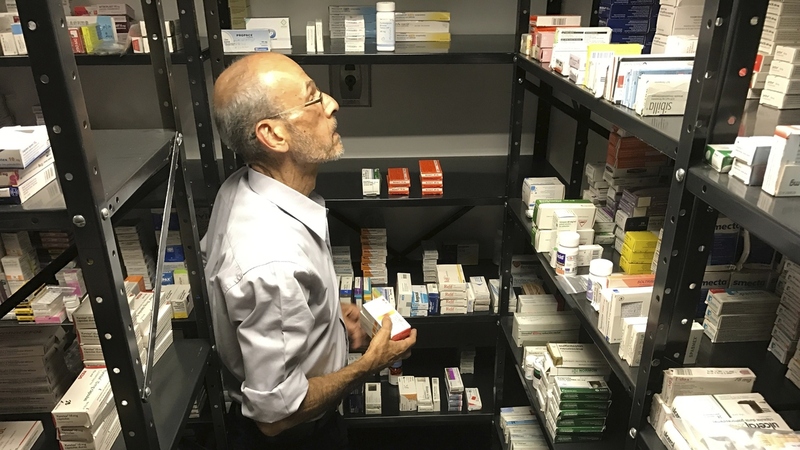 A volunteer from the non-profit Accion Solidaria organizes imported medicines alphabetically, in a store room in Caracas, Venezuela, last April. The Pharmaceutical Federation of Venezuela estimates the country is suffering from an 85 percent shortage of medicine. The death of a former major league baseball player in his native Venezuela this week is renewing concerns over the Latin American country's growing health crisis amid ongoing economic and political turmoil. Marcos Carvajal, a 34-year-old former pitcher for the Colorado Rockies and Florida Marlins, died of pneumonia on Tuesday. He fell sick in December, but the antibiotics needed to treat the illness were hard to find. Drugs for Carvajal eventually were sent from abroad but he relapsed, returned to the hospital on Monday and died the next day. The entire Venezuelan health care system is on the verge of collapse, says Francisco Valencia, head of the public health advocacy group Codevida. Some hospitals lack electricity, and more than 13,000 doctors have left Venezuela in the past four years in search of better opportunities. "They don't give food to the patients in the hospital," Valencia tells Here & Now's Peter O'Dowd. "They don't have the proper medical supplies to take care of the people who go to the emergency [room] like gloves, like every basic thing they need for an emergency." According to the pharmaceutical association, there is also a 90 percent deficit of other medical supplies and drugs used to treat more serious conditions like cancer. The shortage has forced Venezuelans to go looking for medicine on the black market, Valencia says. Even if they find the right medicine, which is often smuggled from Colombia and Brazil and could be expired, most people can't afford it. The crisis affects Valencia personally, who relies on medication for a kidney transplant. "I haven't received my medicine since August last year," he says. "Right now, I'm taking medicines that [have] expired, and my transplant is at risk." Venezuela's President Nicolas Maduro has refused to accept humanitarian aid, blocking shipments of medicine and first aid supplies. Government data shows infant mortality rose by 30 percent in 2016 and malaria infections shot up 76 percent, Reuters reports. "So most countries when they're hit by a crisis, they're taking aid from other countries, from NGOs," Associated Press reporter Hannah Dreier told NPR in 2016. "But Venezuela keeps refusing to take donations that other countries are offering and is actually turning back shipments of donations that people have given in places like the U.S., not letting medicine in." Drug prices have skyrocketed along with those for food and other basic necessities. The International Monetary Fund predicts inflation will soar to 13,000 percent this year and the economy will shrink by 15 percent. Earlier this week, the government announced it would abandon one of its two official foreign exchange rates, which had been used for food and medicine imports, Reuters reports. The policy change could encourage businesses to import more goods, but critics say it won't be very effective due to the lack of hard currency in Venezuela. The elimination of the exchange rate was "a step in the right direction because it helps correct foreign exchange distortion," Asdrubal Oliveros of local consultancy Ecoanalitica told Reuters. "But without dollars, things will continue to be more complicated." Since the collapse of Venezuela's oil-rich economy in 2014, the country has struggled to raise hard currency. The monthly minimum wage for many Venezuelans is now equal to $3, according to the AP. Maduro blames the country's growing crisis on foreign economic sanctions, claiming that the U.S. is leading an effort to wipe out socialism in Venezuela, according to Reuters. Presidential elections are set to be held by April 30, which is much earlier than usual, but Venezuela's pro-government Supreme Court last week banned the main opposition party from running.